With more than 18,000-acres of crystal blue water and 310 miles of sandy beaches, Possum Kingdom Lake has become one of the premier locations for tourists in Texas. While many travel just to spend a few days at this Texas gem, I’m one of the lucky few who get to call this place home. So, if you’re considering making Possum Kingdom Lake your home, be sure to contact me, your premier Possum Kingdom real estate agent. Located only 90 west of Fort Worth, Possum Kingdom is known as “The Great Lake of Texas.” On the southside of the lake, residents take in views of the cliffs and enjoy some of the best fishing in the state. While more popular in the ocean, many partake in scuba diving and snorkeling on the lake as well. Possum Kingdom Lake is more notably recognized for the two large cliffs that make up Hell’s Gate. This area is one of the one of the premier party destinations on the lake is home to the yearly 4th of July fireworks display and is the only spot in the United States that has hosted the legendary Red Bull Cliff Diving competition. Known for being an active community, Possum Kingdom offers 16 miles of hiking and biking trails off LaVilla Road. Travel through wooded areas and limestone canyons to views 350 feet above the lake or hike up Johnson’s Peak to catch a glimpse of the 360-degree views of the lake and cliffs. If getting competitive is more your style, then gear up and show off your skills at the annual triathlon or grab your irons and spend the day at the local golf course, The Cliffs Resort. With a 4 ½ rating from Golf Digest, The Cliffs has been ranked as one of the top golf courses in the state. Perched 200 feet above the lake, the par-71 course is known as one of the most difficult courses in the state. 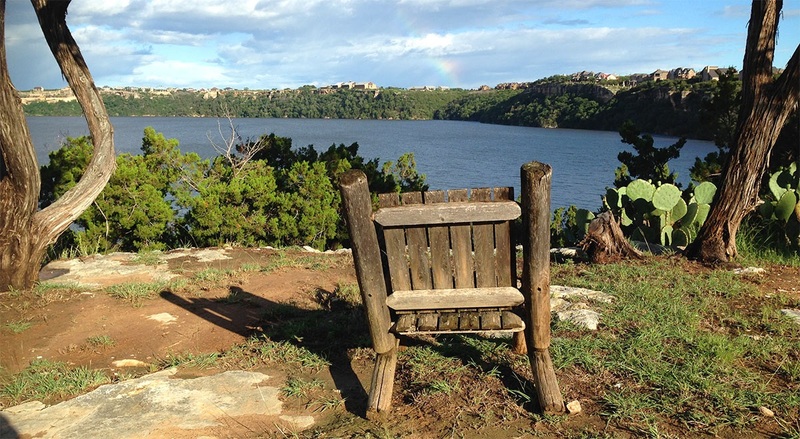 Home to some of the best camping in the state, Possum Kingdom State Park offers beautiful campsites that are well maintained and have scenic views of the lake. Patrons have the option of camping in a tent or RV and there are also cabins for rent. There are more than 100 campsites to choose from on the cliffs. Not really an outdoorsy person, no worries. Check out my list of favorite places to stay.